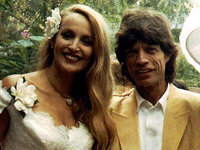 Mick Jagger married Texan-born supermodel Jerry Hall on November 21, 2990 on a Bali beach. They exchanged vows in a Hindu ceremony with Hall wearing a knee-length, off-the-shoulder wedding dress in white lace, by designer Antony Price. The dress was reported to cost £300-£500. But after a nearly 20-year courtship and nine years of marriage, Jagger had the marriage annulled in 1999 at the High Court in London on the grounds it was not valid under either English or Indonesian law. It was reported that Hall was awarded as much as £12.5 million in the “divorce” settlement.